Any child active in contact sports should think about using a mouth guard to protect their teeth, mouth, and jaw. The use of a mouth guard is very similar to the use of orthodontic technology as they both share the ideas of keeping someone’s smile safe and intact. At Iezman and Osterman Orthodontics we use these same ideas to keep our patients healthy and happy! Using a mouth guard for contact sports is not just a good idea, it’s a great one! This is especially true for children who have had orthodontic treatment before because it can be easily reversed with a ball or elbow to the face. It’s easy to think any smile is safe until your kid ends up with missing teeth. Patient cooperation is one of the most important underlying factors for treatment success, and it’s important we all work together to ensure a healthy final orthodontic result. The use of mouth guards helps make this happen. Did you know people who are engaged in contact sports are 60 times more likely to damage their teeth when not wearing a mouth guard? Also, studies have shown that mouth guards prevent over 200,000 mouth or tooth injuries per year … sorry tooth fairy! Losing one or more teeth can be traumatic and expensive. As much as much $10,000 or more may be spent per tooth to repair any damage over a lifetime. It pays to wear a mouth guard, but you pay even more if you don’t. Don’t make your child just another dental statistic and don’t waste the money already spent on any orthodontic treatment. Make the use of a mouth guard a habit and remove the risk of damaging any teeth out of contact sports. A mouth guard is very common in sports like basketball, boxing or hockey, but should also be used with any other vigorous activities or unorganized sports as well. 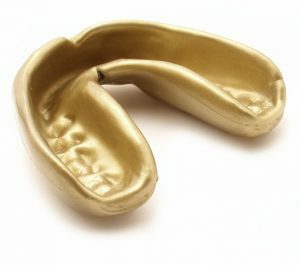 Mouth guards are worth their weight in gold because they are a long-lasting investment in a healthy and beautiful smile. Protect your child’s smile by instilling the use of a mouth guard and never worry about unnecessary injuries or dollars spent again! Contact our North Berkley, South Berkley or Lafayette CA office of Iezman and Osterman Orthodontics today to learn more about mouthguards and discuss any questions you may have.